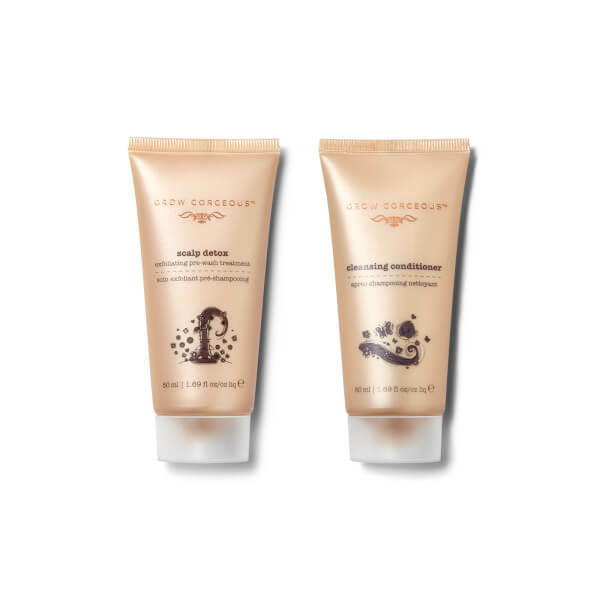 The travel size Grow Gorgeous Detox Duo has been carefully curated to offer you a full hair care routine. The pre-wash treatment and cleansing conditioner work in synergy to promote an optimum environment for hair growth. Utilising plant-based actives and nourishing ingredients, the unique, cooling formula combines natural Castor Oil Beads with White Willow Bark extract and Pomegranate Fruit Enzymes to gently exfoliate the scalp, providing a deep, intensive clean that eliminates clogging impurities, product build-up, dry skin and dandruff to create an optimum environment for hair growth. A potent blend of minerals aids moisture levels while absorbing excess sebum, extending time between washes, with Bean Bio-ferment working to neutralise UV light and external attacks for optimum protection. Suitable for use as an intensive weekly treat, the exfoliating pre-wash treatment leaves the scalp feeling rigorously purified and fresh, with enhanced stimulation to promote lustrous, revitalised hair and improved re-growth capabilities. Vegan. Combines foamless shampooing with deep conditioning to revitalise your hair and rebalance your scalp in one simple step so you can say goodbye to the traditional hair care regime. Offering 11 individual benefits, the treatment has an air-light texture that won't dry out your hair or strip it of its natural oils, working to absorb excess oils, wash out product build-up and eliminate toxins for improved lustre and vitality. Enriched with an advanced Conditioning Complex, the softening formula coats each individual follicle and works to smooth the cuticle for a sleek, frizz-free finish. Gentle enough for daily use and suitable for all hair types, the multi-tasking conditioner reduces flyaways, adds superior volume and hydrates your hair and scalp. Expect hair to feel sumptuously soft and supple with a healthy-looking gloss. Scalp Detox: Use 1-2 times a week as a pre-wash treatment, before cleansing hair. Wet hair and scoop a generous amount from the jar, rubbing it between your hands. Use your finger tips to massage the product all over the scalp in circular motions. When the entire scalp has been thoroughly exfoliated, leave for a few minutes to allow the cooling sensation and purifying properties detoxify the scalp. Thoroughly rinse and cleanse your hair using Grow Gorgeous Cleansing Conditioner or shampoo. 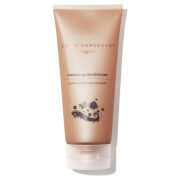 Cleansing Conditioner: Add a generous amount to wet hair, massaging into scalp before smoothing through to ends. As our Cleansing Conditioners are sulphate-free you won’t experience much of lather from the product, we promise it’s still working. After three minutes, rinse thoroughly, while continuing to massage hair and scalp. Dry and style as normal to reveal gorgeous hair. Scalp Detox: Aqua (Water), Glycerin, Hydrogenated Castor Oil, PEG-6 Caprylic/Capric Glycerides, Lactobacillus/Punica Granatum Fruit Ferment Extract, Carbomer, PEG-40 Hydrogenated Castor Oil, Parfum (Fragrance), Lactobacillus/Dipteryx Odorata Seed Ferment Filtrate, Phenoxyethanol, Sodium Hydroxide, Menthol, Menthyl Lactate, Leuconostoc/Radish Root Ferment Filtrate, Allantoin, Disodium EDTA, Ethylhexylglycerin, Salix Alba (Willow) Bark Extract, Zinc PCA, Niacinamide, Sodium Starch Octenylsuccinate, Calcium Pantothenate, Maltodextrin, Butylphenyl Methylpropional, Limonene, Linalool, Sodium Ascorbyl Phosphate, Pyridoxine HCL, Tocopheryl Acetate, Silica.